Fay Jones School alumna Amanda Collen (B.I.D. ’18) headed to Maine in August 2018 to take part in a nine-day design-build project. Collen, who now works at DLR Group|Staffelbach in Dallas, was one of 10 students from around the country chosen for the project, which was organized by Island Design Assembly. 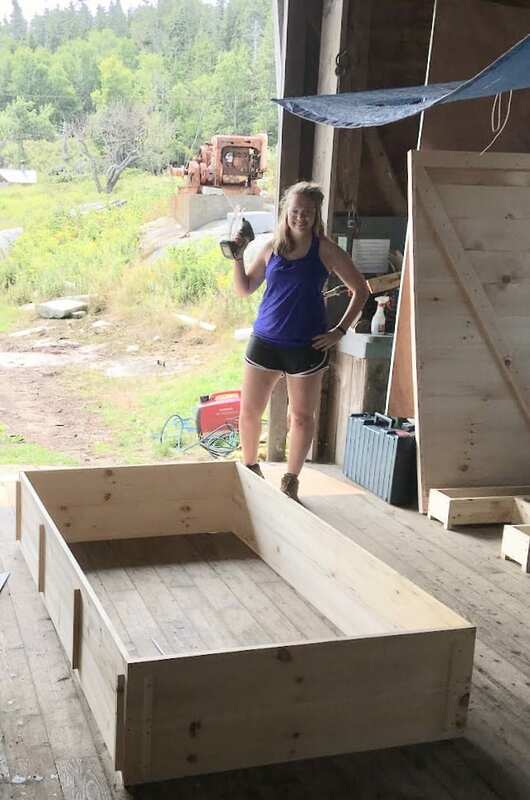 Amanda Collen is working to build part of the bathhouse. 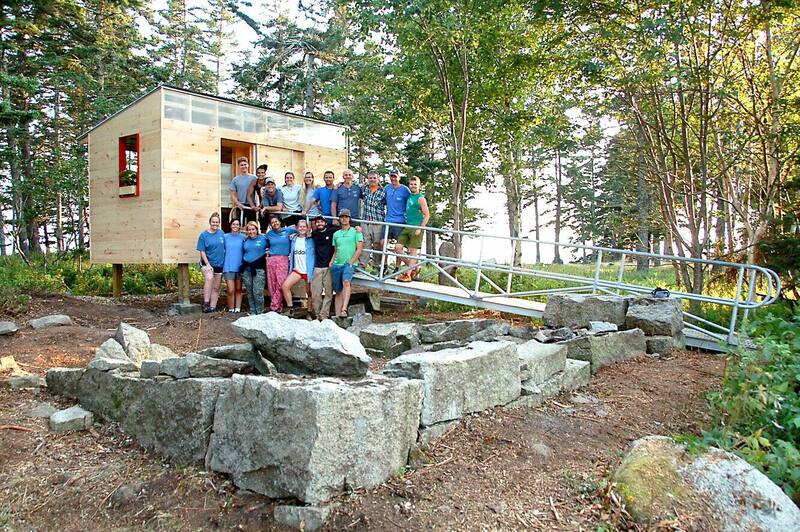 The Island Design Assembly program brings together a team of students, architects and educators to design, build and install a project for an island community in Penobscot Bay, Maine. The teams live off-the-grid for a week while they design and build the projects. McLeod Kredell Architecture in Vermont runs the program. 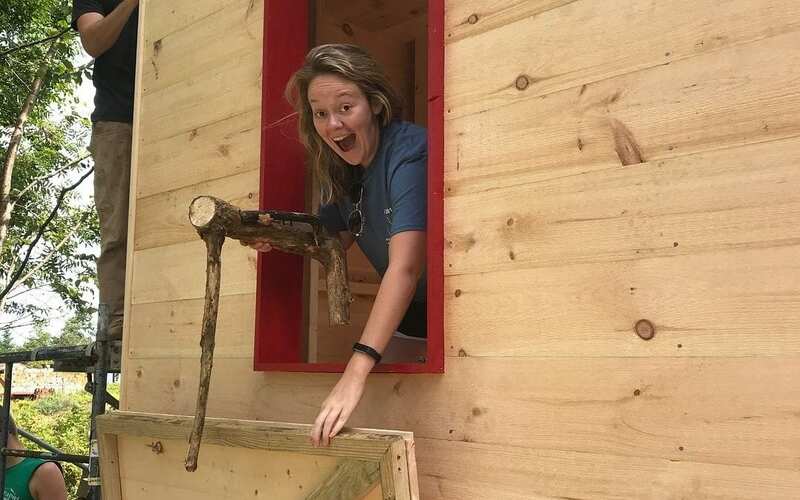 While Collen was still an interior design student at the Fay Jones School, she took part in Frank Jacobus’ fall 2017 design-build studio, during which a group of nine students designed and built a bus stop. After that, Collen said she realized that she loved the design-build process. So last spring, she applied for a spot in Island Design Assembly. Collen and her peers lived and worked together off-the-grid in Hurricane Island, Maine, which is a small island measuring about one mile by one-half mile that used to house a granite quarry. The goal was to build a bathhouse for the Hurricane Island Foundation staff. 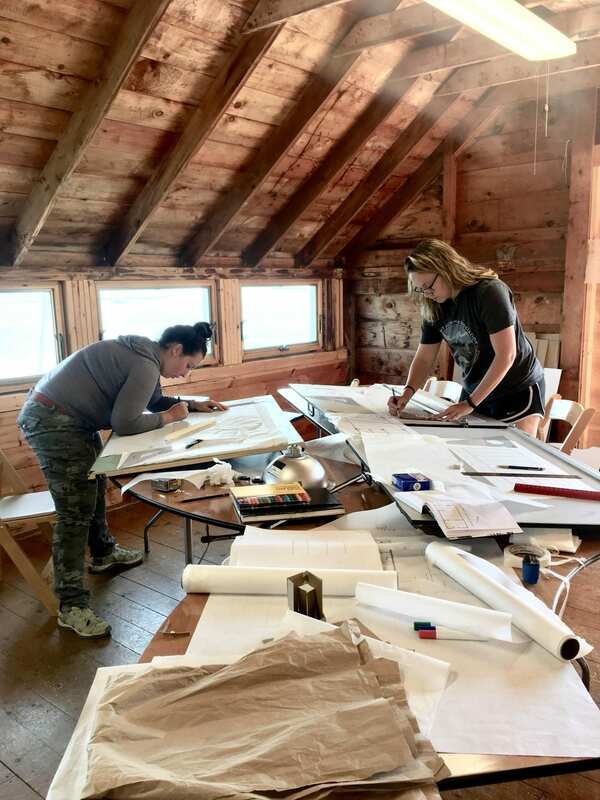 The foundation integrates science education, research and leadership development through their year-round programming and a seasonal, environmentally stable island community. Collen and her team developed a bathhouse solution to meet the needs of the people who would use it, bearing in mind that the island has no running water or electricity. The bathhouse includes a compost toilet, a solar shower system using shower bags, cubbies for each of the staff members to keep items in for convenience and two sinks that operate by a rainwater collection system. 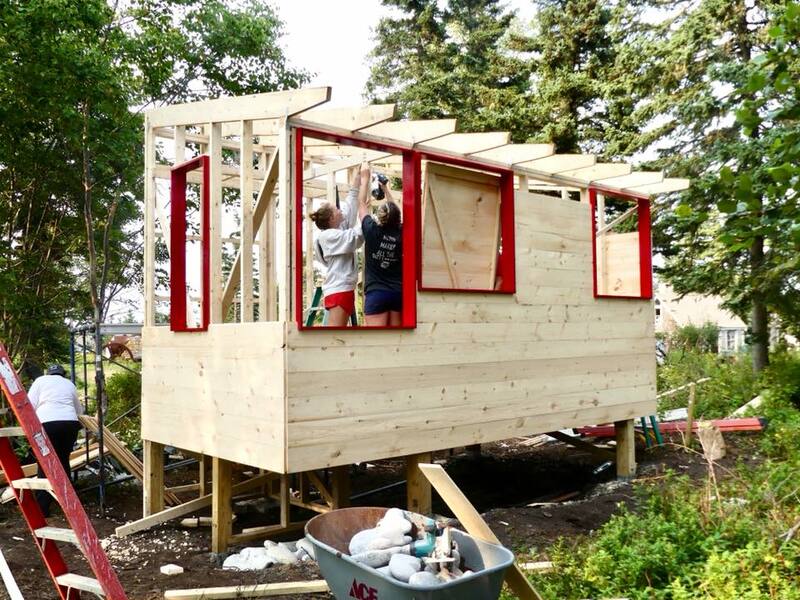 The students designed and built the bathhouse in about nine days. “When we arrived, we explored the island and learned a little bit about the Granite Quarry Town history. We did precedent research and discussed what did and didn’t work in past IDA projects they have done. “The next day we interviewed the staff to ask what they wanted in a bathhouse. It turns out that there was only one bathhouse on the island (a 10- to 15-minute walk away from the staff cabins), and they would have to share with students, younger kids, etc. They did not take frequent showers, so it was our job to design and build a staff-only bathhouse. “There are about 15 to 20 staff members living on the island during the summer months when they do their research and educate different groups of students (elementary through college). “Next, we surveyed the site and started coming up with where we could build. I was in charge of sketching the site in my sketchbook so we could then draw a detailed one in the studio. We broke into groups and began drawing and modeling ideas for a design. Amanda Collen sketched the site in her sketchbook and they later worked on developing a bathhouse design to meet the needs of the site and the people who would use it. “After an afternoon of collaborating, we came up with a design that merged some ideas together. I was put on the drafting team, while some students were sent to the site to clear the brush, cut down trees, and begin the foundation. “After the plans and sections were drawn, I headed to the site to help out with the foundation and beginning on the building of our bathhouse. Slowly more materials came in and we got further and further. I did design the cubbies (which the staff specifically asked for storage space), so I was able to make that in the shop with John and another student. “It was so neat being able to see my design come to life and actually be a part of the hands-on building aspect. I did so many things from using all of the power tools – jigsaw, circular saw, Sawzall, etc. – to hammering wood on the roof. The design team stands in front of their completed bathhouse.